If you like super rich desserts, then great news! 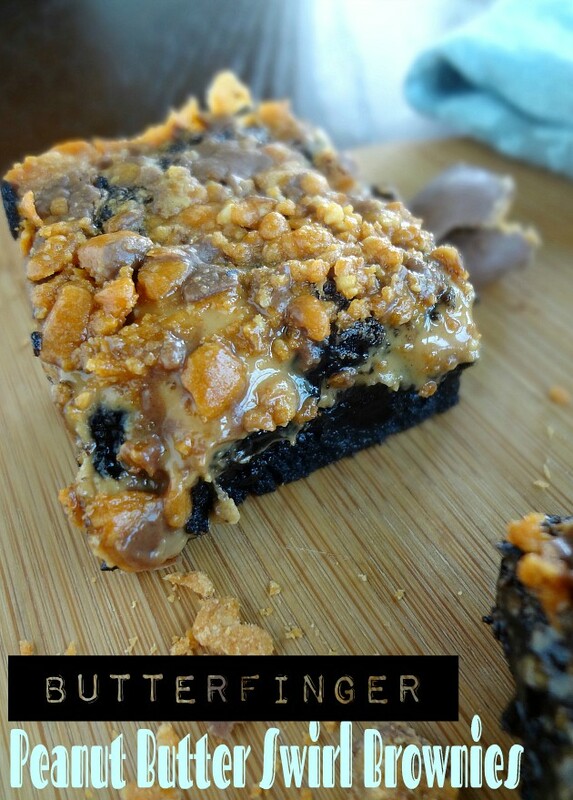 I've got a super dense and fudgy brownie with peanut butter swirled in to the top and then lots of crunchy crushed Butterfingers on top of that. They're awesome-people love them. Michael enjoyed them with ice cream too (apparently it added a refreshing element to the richness :P). May I suggest these as a potential option for your holiday baking? 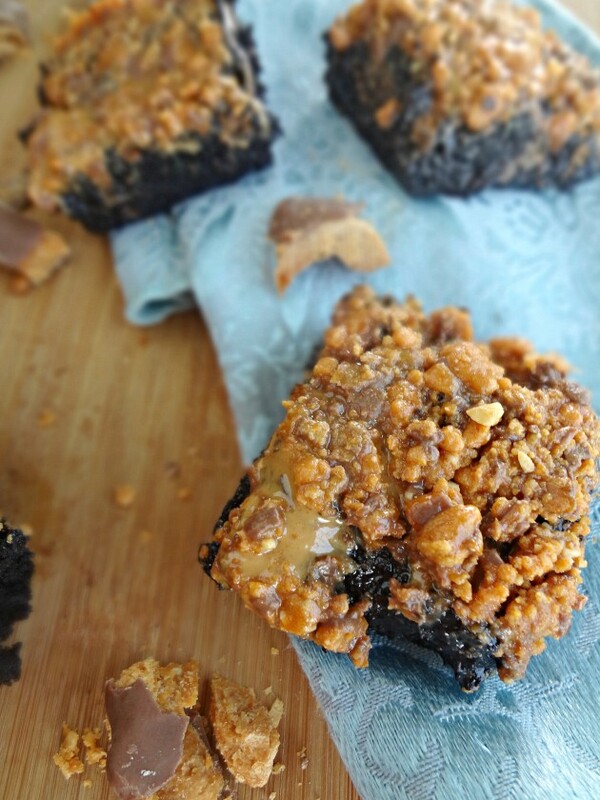 They're super tasty and are sure to be a huge hit with any non-peanut allergy crowd. They're also kind of ridiculously easy to throw together, so really none of us have any excuse to not be eating one of these ASAP. Position rack in lower third of the oven and preheat to 325F degrees. Line bottom and sides of an 8" x 8" square baking pan with parchment paper or foil-with some overhang on opposite sides (for lifting later). Lightly spray with non-stick cooking spray (I also like to spray the pan before adding the paper/foil to help it stay in place better). Add butter, sugar, cocoa, and salt to a medium, heatproof, bowl. Microwave 1 minute and 30 seconds on high power. Remove and stir until smooth. Let cool until warm (not hot). Add eggs, one at a time, stirring vigorously after each egg. Add flour and stir until you can't see any more flour-then mix vigorously for about 40 strokes. Add seven 1/2 tbsp. 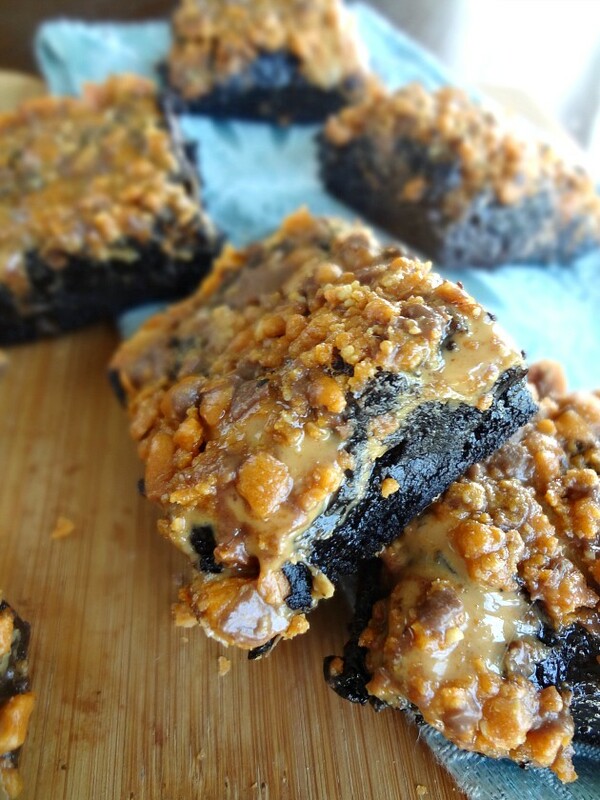 dollops of peanut butter across the top of the brownie batter. Use a knife to swirl the dollops over the top. 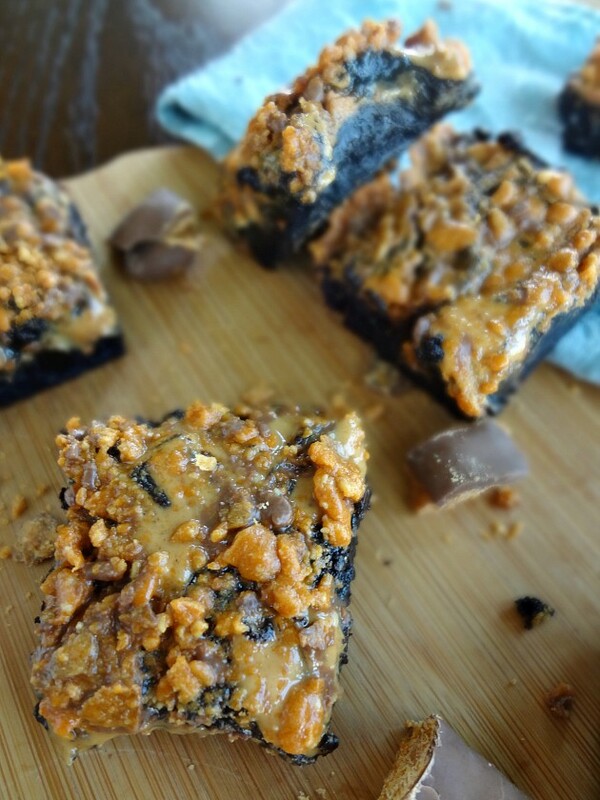 Coat the top of that with crushed Butterfingers. Bake 25-30 minutes (until a toothpick inserted in the middle comes out just slightly moist). Lift the overhanging parchment paper or foil and transfer brownies to a cutting surface. Cut into as many squares as you desire. Store leftovers in an airtight container at room temperature (or in the refrigerator) for up to 1 week.